← Flux:: Evo Channel – A great video from ‘In The DAW’ ! Nomad Factory 80′s Spaces has become a favorite of some very well-known sound engineers since its release in December 2017. 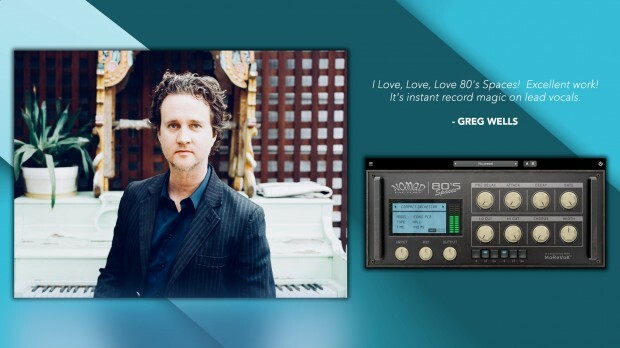 This week, we received a great testimonial from non other than Greg Wells (Adele, Katty Perry, Mika, One Republic) about the 80′s inspired reverb plug-in. And to celebrate, it’s on promo until June 30th! ” I Love, Love, Love 80′s Spaces! Excellent work! The name says it all. 80′s Spaces is an original “80′s vibe” plug-in that is totally in sync with the return of the “sound” that made a great musical era. It is surely the most original and creative plug-in ever built by Nomad Factory. It “magically” reproduces the typical reverbs and space effect units used by legendary artists such as Michael Jackson, Madonna, Duran Duran, Guns ‘N’ Roses, Tears for Fears, David Bowie, Depeche Mode, U2, Eurythmics, George Michael, Phil Collins, Queen and so many others. Your classic gated reverbs, lush, cavernous and sweeping tails, short rooms and chorused verbs are all here. With minimal adjustments the user-friendly interface allows you to adjust the dry/wet control, chorus, decay, gate, filter and other parameters to get just the effect you require. This entry was posted in DontCrack, Plug-ins, Promotions and tagged 80's, 80’s SPACES, AMS, Gated Reverb, Hall, Lexicon, Nomad Factory, Plate, Reverb, Room, Yamaha. Bookmark the permalink.